Is there a new "new economics"? “New economics does not accept the orthodox theory that has dominated economics for the past several decades that humans are perfectly rational, markets are perfectly efficient, institutions are optimally designed and economies are self-correcting equilibrium systems that invariably find a state that maximises social welfare." The problem is that not even one of the authors cited above is heterodox (yes, not even Sen, what you guys expected North or Simon?). For the most part, all these authors and traditions accept mainstream marginalist theories as logically consistent, but incomplete and somewhat unrealistic. The problem with neoclassical economics, in this view, is that it’s not realistic. The heterodoxy is supposedly the result of more realistic and relevant theories. Fundamentally regarding individual behavior. Because the new “new economics” has a methodological individualist vein, or so it seems (see the chart Beinhocker provides for the differences with the mainstream, in the macro part, you won’t find a critique of the natural rate hypothesis, it’s all about heterogeneous agents, and some sort of path-dependency; the latter is closer to being relevant; on that go here). Note that in the policy discussion one of the key macro stories is the Geanokoplos et al. model on the possibilities of bubbles (and he does believe in the relevance of conventional overlapping generations and Arrow-Debreu model, of course). Don’t get me wrong. 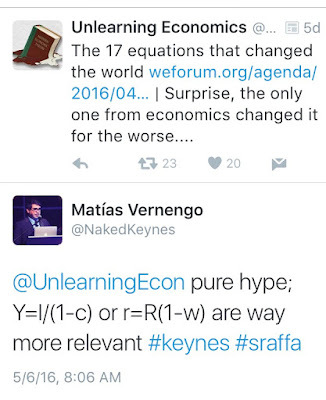 I’m all for external critiques of mainstream economics. And I think there are important lessons from some of these fields. But they are all about imperfections. In my view, economics has to be rebuilt on the foundations of old economics. The old economics of the classical authors and Marx, that understood that distribution reflects social conflict, in particular, class conflict, and the old “new economics” of Keynes, that understood that causality implied that demand determines supply (and not vice versa as in Say’s Law). Sure you might add complexity, and heterogeneous agents, and institutions (perhaps more than property rights? ), and that helps too. But complexity, heterogeneous agents and other 'imperfections' are there, as I noted in my debate with Colander et al. as a way of making the mainstream more reasonable, and not to bring down a theory with insurmountable logical problems. My two cents. * As promised I'll discuss Hayek when I have the time to write a response to Mirowski. And yes, many authors that believe they have abandoned marginalism still use it. Keynes himself was not completely able to get rid of the old ideas. 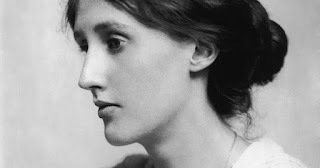 As he said: "The difficulty lies, not in the new ideas, but in escaping from the old ones, which ramify, for those brought up as most of us have been, into every corner of our minds." BEA released the second estimate of the first quarter GDP, and it's up from 0.5 to 0.8%. Not bad, not great. Note that federal government spending is a drag on the recovery (although local and state governments are positive force, and part of that is actually funded by the federal government anyway; so the actual negative impact of contractionary fiscal policy is smaller than what the numbers suggest). At any rate, this will be used to demand higher rates in the next meeting of the FOMC. You can bet about it. Listen to Dean Baker at the Rick Smith Show here, suggesting why this is a terrible idea. In both cases, back during the Caracazo and now, the current account deficit has been at the center of all problems (see figure above). And while one can blame the left of center governments of Chávez and Maduro for not being able to break the structural dependence on oil, it is hardly the case that this is a problem just of the left of center governments. 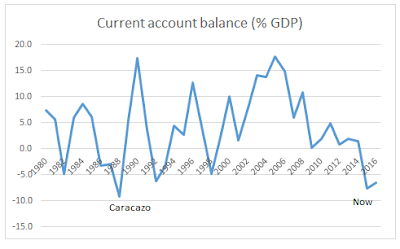 In fact, even with this terrible collapse of the economy, for the period as a whole starting in 1999 (or 2003, after the Chávez administration survived the US sponsored coup, and took over the oil company), the economy grew considerably (see figure below). So growth has been tied to terms of trade and the price of oil. 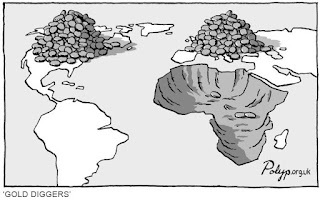 Also, not only the economy collapses when the price of oil collapses, but exchange rate depreciation, in the black market now, leads to high inflation, which goes often with shortages. Anybody that has lived through high inflation in Latin America in the 1980s knows this. It has nothing to do with fiscal policy, or with the central bank printing money. The fiscal situation worsened as a result of lack of growth and the external problems (see figure below). This is a tragedy, and there are no good solutions. Mark Weisbrot suggests depreciating the exchange rate. But normally this operates by making imported goods more expensive, and leading a recession and lower imports. As he notes, the recession has already done a good chunk of that job, and imports have already collapsed. And Venezuela cannot expect much external help, certainly not from the IMF and the US, not while Maduro is in power. My guess is that there is a good chance that the government of Maduro will not resist and that a right wing government will come to power and adopt a neoliberal program. This would bring almost no relief in the short run, even though access to IMF funds might mitigate the balance of payments for a while, and allow to reduce the worst elements of the crisis, like the food shortages. I should note also, that while it is not surprising that Maduro's government is unpopular in the middle of this crisis (like Dilma was in Brazil), it would be a stretch to suggest that most people want a return of neoliberal policies (in fact, in Brazil the country remains divided, as much as in Argentina, were the neoliberal Macri only won a narrow victory by deceiving the electorate). The problems of the long cycle of the left in the region, tied to the high prices of commodities, and the reduced popularity of left of center politicians, does not translate into an acceptance of neoliberal policies, and more popular resistance can be expected now, as compared to the 1990s, when the Washington Consensus policies were adopted. While the Neoliberal movement’s concerns extend into a broad political reorganization of society, it remains intimately connected with neoclassical economic thought. 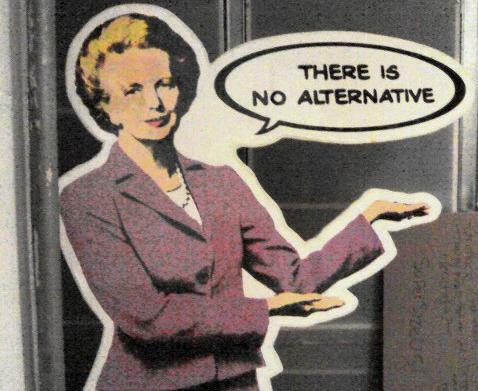 The idea of a Neoliberal Thought Collective (NTC) being a “completely different school of thought” from neoclassical economics is not quite correct. It is true that Neoliberalism transcends the more limited scope of neoclassical economics with a much broader preoccupation with the political reorganization of society. On the other hand, it is hard to think of any Neoliberal author cited by Mirowski that does not fall within the neoclassical school. Read my full reply to his paper here. PS: There is also a response to Mirowski by Kari Polanyi Levitt and Mario Seccareccia here, and one by Alessandro Vercelli here. Several Latin American economies (Brazil, Chile, Colombia, Mexico, Peru) adopted full-fledged inflation targeting regimes at the end of the 1990s and beginning of the 2000s. Others are following suit including the Costa Rica, Dominican Republic, Guatemala, Paraguay and more recently Argentina. Inflation targeting is defined by its proponents as a monetary policy framework, rather than iron clad rule as monetary targeting, consisting in the public announcement of numerical targets (a point inflation rate, a range or a point with a tolerance range) acknowledging that price stability is the fundamental and hierarchical goal of monetary policy and a commitment to transparency and accountability. Transparency means that the monetary authorities must communicate their targets, forecasts of inflation, decisions on monetary policy and the motivation for their decisions. Accountability means that the monetary authorities are responsible for attaining the announced objectives and subject to “public scrutiny for changes in their policy or deviations from their targets.” Full fledge inflation targeters practice ‘flexible’ inflation targeting entails pursuing a ‘gradualist’ approach to the achievement of monetary policy objectives. The Latin American experience underscores some major limitations of inflation targeting. First, inflation targeting is not intended to reduce inflation and countries adopt inflation targeting regimes at very low inflation rates. The available empirical evidence shows that Latin American countries adopted full- fledged inflation targeting regimes at one-digit inflation rates. Latin America´s high inflation periods occurred in the 1970s and the 1980s. Inflation began to decline in the mid-1990s for the great majority of Latin American irrespective of their monetary and associated exchange rate regimes (Table 1). Implementing inflation targeting regimes at a one-digit inflation rate level has an obvious theoretical justification: the condition for stability in an inflation targeting model is that the policy rate of interest in real terms must be positive (the nominal rate of interest has to exceed the future expected inflation rate). A two-digit inflation rate means that the Central Bank must adopt a two-digit monetary policy rate which in turn implies that the structure of interest rates must also conform to those levels. 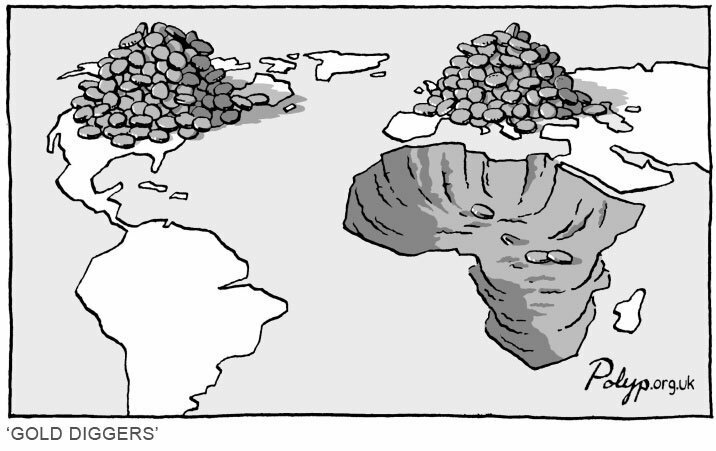 There is here an important policy lesson for Argentina. The current authorities of the central bank of Argentina are committed to the adoption of inflation targeting. Since the rate of inflation is above 40% (the highest in more than a decade and half) this would also mean that the monetary policy rate must be set above the inflation level. With a structure of the terms of interest hovering above 40% do the Argentine authorities believe they can foster growth or are they trying to provoke a giant recession? Second inflation targeting requires stable and certain economic conditions that can guarantee policy continuity but which are not present in the real world. According to its proponents, inflation targeting is about managing inflation expectations through public credible announcements in order to avoid abrupt changes in interest rates, output and employment. This is the main reason for ´flexible inflation targeting´ which implies continuous gradual changes in the monetary policy rate over time allowing agents to adapt their behavior to the existing monetary conditions. Thus, if the inflation rate is above target a tighter policy stance should translate into a continuous path of gradual interest rates increases over time until the rate of inflation converges to the target. Yet in many instances, the required conditions for policy continuity are simply not present because central banks can easily misread current conditions. As a result the aim for policy continuity turns in practice into a stop-and-go policy. This is what has happened in the last couple of years in Latin American inflation targeteres including Chile, Mexico and Peru. Third the presumption that interest rates can manage both inflation and economic activity is wrong and in reality we often find is a disconnect, between interest rates, inflation and economic activity. Chile provides an interesting case of the disconnect between interest rates, inflation and economic activity: (i) inflation is currently at 5% annually above the target (3%) and the upper bound of the inflation target (4%); (ii) the monetary policy interest rate was negative in real terms during most of 2015 and after a 25% basis point increases the monetary policy rate is roughly zero in real terms; and (ii) the rate of growth has slowed down in the past two years to 2% from 5.5% and 4.% in 2012 and 2013. Fourth so what is inflation targeting all about? Well, in some cases it is simply a policy to maintain the profitability of the financial system. 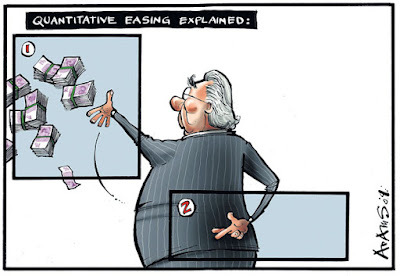 Inflation targeting is portrayed as a very harmless policy: it is gradualist, it avoids giant costs in terms of employment, it promotes credibility and accountability, and it allows the full use of resources once the inflation target is met (this is known as the Divine Coincidence). 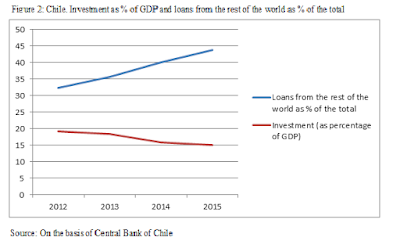 Yet there is an aspect of inflation targeting which is harmful that is seldom mentioned and which has to with the relationship between the central bank and the financial system and which can be illustrated with the case of Latin America and more particularly with Chile. The Chilean Central Bank as a policy rate that is zero in real terms (and that was negative for almost a year). Commercial borrow from the Central Bank but commercial banks charge positive real rates of interest on their loans to consumers and businesses and pay nothing in real terms for their loans from the Central Bank. Central Bank policy can easily become captive to the interests of the financial sector…So much for Central Bank independence. A very short paper on a very broad subject, co-written with David Fields, which was presented at the last ASSA Meetings in San Francisco. It is forthcoming in the Review of Radical Political Economics (RRPE). The title is derived from Gunder Frank's ReORIENT, that David and I always thought was thought provoking, but surprisingly Monetarist in its assumptions about money. The paper also adds a discussion of Pomeranz famous views on the Great Divergence, particularly the views regarding technological change, which are marginalist at its core, as well as those of Gunder Frank and some of his critics, like Arrighi. This paper analyzes the revisionist literature on the Rise of the West. Revisionist authors suggest that the so-called Great Divergence is relatively recent, and that good luck – in the form of silver from the Americas, and abundance of coal, rather than European exceptionalism – was central for the higher rates of growth of GDP in the West. This paper argues that while the revisionist literature provides relevant critiques of conventional accounts of the Rise of the West, it remains rooted in marginalist or neoclassical views of both the role of money and technological progress, and that abandoning these theoretical foundations would strengthen some of its arguments. As far as I can tell, there aren't many papers in economic history that properly acknowledge the contributions of the revisionist literature, but also of the Military Revolution (Parker), the Consumer Revolution (McKendrick), and the Fiscal-Military State (Brewer). In fact, these historical schools are more compatible with non-marginalist views of the functioning of the economy that emphasize the role of demand and endogenous money in the explanation of the Rise of the West. 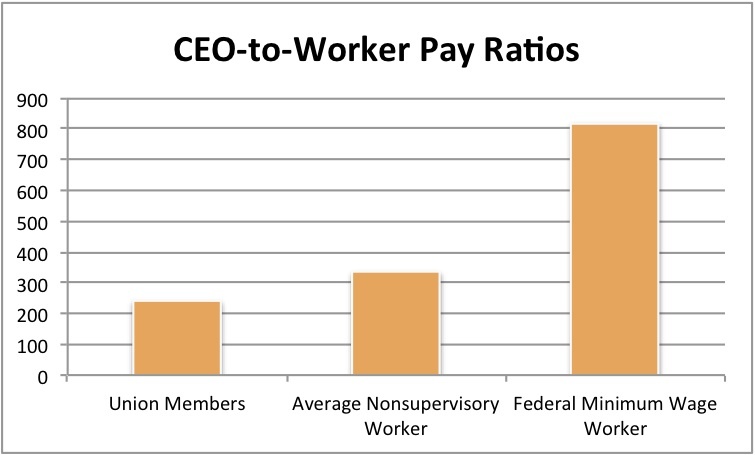 New data by the AFL-CIO Executive Paywatch, available here. Note that union members do much better than nonunion members, and certainly than minimum wage workers. For more context read this EPI report. You must admit that the use of flawed neoclassical thinking is sometimes amusing. In this Bloomberg post, an 'expert' (aka hired gun) from a free market think tank (pro-corporations propaganda machine) says that the "AFL-CIO study [is] 'useless' because it compares two different labor markets that should be evaluated separately. 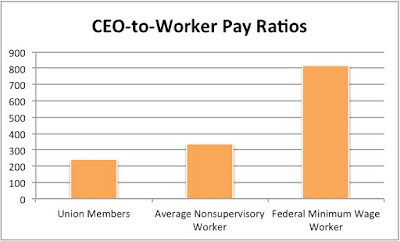 While most workers could easily be replaced, he said, CEOs are 'much harder to substitute.'" Yes, they are receiving according to their productivity, and is so hard to find these geniuses. Neoliberalism is resurgent in Latin America, and quite never left in the US anyway. And everything indicates that, either with Trump (yes, he does have a right-wing populist discourse, but I wouldn't take it too seriously; see his tax plan) or Clinton, it will continue to do well here, even if there is clearly a desire for change. This paper by Mirowski discusses the main points of Neoliberalism. A short reply by yours truly will be published soon in the INET website. Today the New York Times pitched in also spreading incorrect news. The Times suggests that Rousseff "is charged with violating budgetary laws in order to conceal a deficit before what she anticipated would be a tough 2014 re-election campaign, borrowing money from banks that the executive branch controls to fund domestic programs, and making changes to the federal budget without congressional approval." Actually, the impeachment is based on delays on payments to public banks in 2015, not 2014, and, hence, not related to the re-election campaign. And the primary balance was changed and approved by congress. But the mistakes are all over the place (listen to this on Bloomberg radio; yeah things are going to be wonderful because markets are confident). The worst part of all of these, and there are many things, not the least the collapse of the economy and the brutal increase in unemployment, is the criminalization of fiscal policy. Note that the Workers' Party maintained primary surpluses for almost all of its period in power. For the most part because a growing economy implies higher revenue. 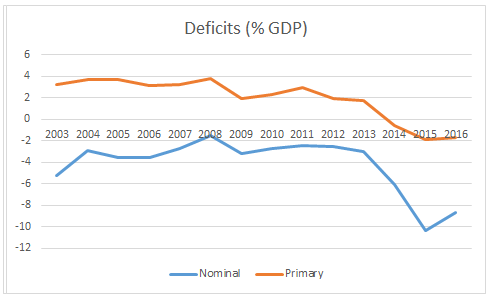 It should be noted that people on the left, like yours truly, always complained of the difference between the primary surplus (red line) and the nominal deficit (blue line), averaging 6% of GDP. The gap corresponds to interest payments that go mainly to the wealthy (see the book on the side for more on that). 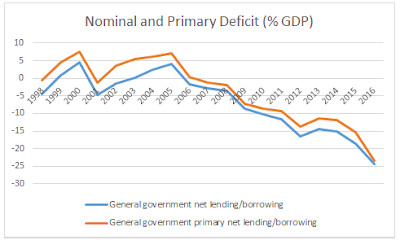 It is only with the crisis itself that the fiscal accounts worsened, and that went hand in hand with austerity policies. Actually more primary spending, and less financial spending, would have accelerated growth and revenue without creating any fiscal problem. And yes net debt went up, but remains below the initial level (see below). And more importantly the debt is in domestic currency. Foreign debt and the current account are not really problems, since Brazil has a pile of international reserves and has access to international capital markets that maintain (and will continue to do so) low interest rates. There is no fiscal problem. There is, however, a backlash among the middle and upper classes against social programs, and the greater visibility of the poor in places that were reserved to the elites (airports, malls, universities, etc.) and a discomfort with the stronger rights for workers (for example maids; if you didn't see the movie The Second Mother you should, it would give you an idea of the social tensions in the country). This is a testament of how much the social hierarchy has been challenged, even by a relatively moderate left of center government. Don't be fooled, it is a coup, and as coups usually do it will turn on its enemies. 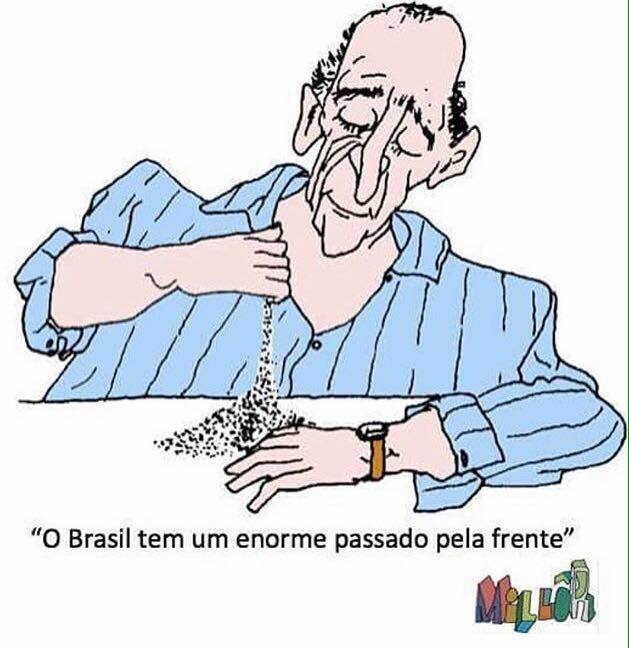 They will try to jail Lula, not just to wreck his legacy, but more importantly because he seems still to be among the few viable politicians in the country. 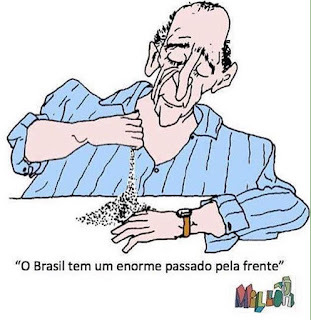 * PSDB stands for Brazilian Social Democracy Party in Portuguese (which in Brazilian politics is really conservative, not social democratic at all). Indeed what Black, Scholes and Merton did was “marketing”, finding a way to make a well-known formula palatable to the economics establishment of the time, little else, and in fact distorting its essence. So market participants already had formulas to price options, and the idea that their version of the formula "helped create the now multi-trillion dollar derivatives market," as suggested by Andy Kiersz, is clearly incorrect. Unregulated financial markets didn't need the Black-Scholes formula, economists did. And we know how well that ended. Deregulation and the nature of competition in financial markets would have led to the expansion of derivative markets anyway. But GE would not look like it could provide practical answers to real economic problems. Which turns out it couldn't. Besides, as discussed here before, the Arrow-Debreu general equilibrium model is not devoid of problems. So what are, if any, the great economic equations, you ask. If I had to say one it would be either Keynes' multiplier formula, Y = I/(1 – c), or Sraffa's demonstration of the inverse relation between wages and profits, r = R(1 – w). * The first clearly shows that spending determines the level of activity and provides formal justification for counter-cyclical policies, which have indeed reduced the effects of recessions on the economy, even if, as Kalecki had noted it would happen, austerity is often imposed for political reasons. The second resolved an issue first clearly posed by Ricardo, is part of the clear understanding of what determines long-term prices, and shows the conflictive nature of the capitalist system. Both are central to understanding the way capitalist economies work. * Where all variables have the standard meaning, Y is output, I investment, c the propensity to consume, r is the rate of profit, R is the maximum rate of profit, and w the wage share. The policy of quantitative easing (QE) pursued by the Federal Reserve following the fall of Lehman Brothers in September 2008 meant to lower long-term interest rates in the United States and boost expenditure had major effects on developing economies including in those of Latin America. 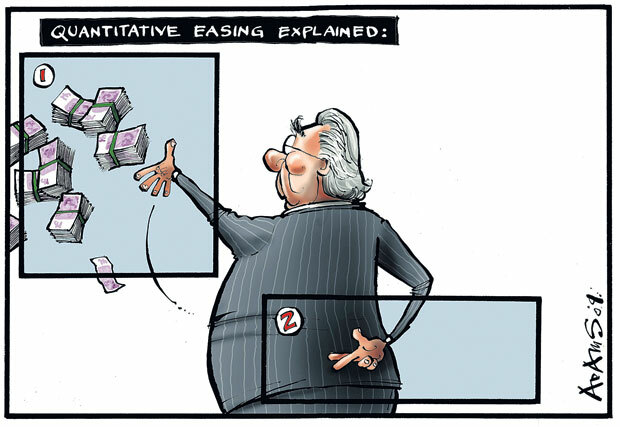 As it is well know QE did not increase liquidity. The liquidity with which the Federal Reserve bought financial assets ended as excess reserves at the Federal Reserve balance sheet and the money multiplier became, actually a divisor (the money multiplier dropped below 1 after the start of QE). However, quantitative easing had an important portfolio rebalancing effect, which altered the relative profitabilities of different assets and made commodities an attractive investment and speculative alternative. Investing in commodities as a way to hedge risk was also championed by mainstream economists. Gorton and Rouwenhorst (2004) (here) argued that commodities and stocks yield similar returns over time so that they are adequate investment substitutes. Moreover they claimed that commodities and stocks are, in terms of levels and volatilities, either not correlated or negatively correlated over time so that investing a part of the portfolio in commodities lowers its total risk. 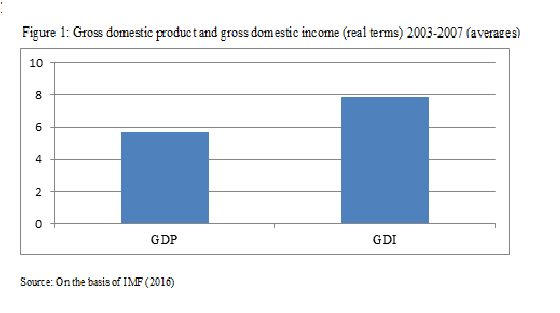 The effect of the boom in commodities during the 2000s in Latin America is reflected in the difference between GDP and gross domestic income (GDI) (the latter is equal to GDP plus the effects of the term-of-trade which were clearly favorable in many Latin American economies. See figure 1 below for a comparison of GDP and GDI for major Latin American commodity exporters. This gave a false sense of prosperity that even endured after GDP growth in most economies of the region began to decline in 2011: domestic income follows GDP but with a lag). Moreover, the increase in commodities and terms-of-trade was accompanied by nominal and real exchange rate appreciation in the great majority of Latin American countries. The appreciation in the exchange rate was detrimental to export diversification but, nonetheless, welcome by policy makers as it permitted to control inflation. Low external interest rates, high commodity prices and income, and exchange rate appreciation set the stage for the large rise observed in the corporate debt following the Global Financial Crisis (2008-2009) in the larger economies of the region. The issuance of corporate debt involved some of the major firms in the region and major commodity producing firms as well the financial sector. According to recent estimates (here) corporate bond issuance in foreign currency increased from US$ 170 to 383 billion dollars between 2010 and 2015 (compare with FDI figures which are of the order of US$ 150-160 billion per year). But these corporate debt estimates are flows. The corporate debt stocks are much higher. Available non-official figures for Brazil point to a corporate debt stock of US$ 300 billion dollars. The corporate debt issue not only affects Latin America but in general the developing world. According to a research note published by the Institute of International Finance (IIF, June 1 2015), the stock of corporate debt outstanding was above US$ 6.8 trillion in 2014. The decline in commodity prices which began in 2011 and turned into an outright crash in 2015 was accompanied by exchange rate depreciation and lower growth. The decline in commodity prices reduced the income flows of tradable sector firms giving rise to a wedge between income flows and debt flows. In the case of the non-tradable sectors, the decline commodity prices plus exchange rate depreciation had both income flows and balance sheet effects. Firms have reacted by reducing the debt issuance and slash capital expenditure which affects negatively investment and growth. As argued by Fitch “the refinancing risk is high and default risk in climbing” (Fitch Latin American Corporate Bond maturities, February 8, 2016). Moreover, as firms have tried to cut investment, this has affected profits so that the corporate sector has increased its debt instead of deleveraging. 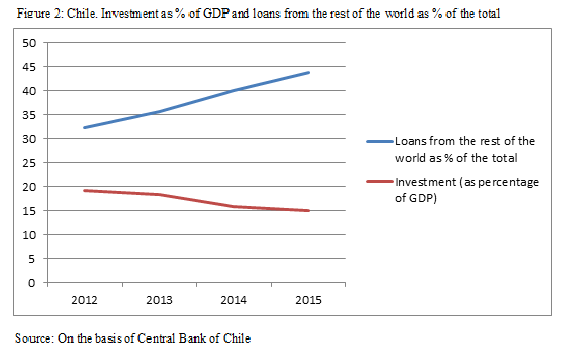 This paradox of debt, prevalent in part of the Post Keynesian literature (See, M. Lavoie, New Foundations of Post Keynesian Economics, 2014) can be illustrated in figure 2 above with the case of Chile and may be a major stumbling block to overcome the current slowdown of some of the major Latin American economies. Jobs report (BLS, Employment Situation Summary) confirms a relatively weak month in April with total nonfarm payroll employment increasing by 160,000. Also, the labor force participation rate decreased and the employment-population ratio both decreased a bit. Mining employment continued to decline, something that Trump promised to reverse and Clinton noted there might not be much we can do about (the implications might not be minor, see here). Also, while unemployment remains at 5% a broader measures of unemployment remain high. For example, total unemployed, plus all persons marginally attached to the labor force, plus total employed part time for economic reasons, as a percent of the civilian labor force plus all persons marginally attached to the labor force is at 9.7%. Robert Paul Wolff always worth. Should read his Understanding Marx. He surprisingly says that Analytical Marxism has taken over Marxism. To get to Marxism he had to learn economics, the classical political economy of the Ricardian kind, and learn linear algebra. Hegelianism was not really central to the message (in my view, but he does say he hates Hegel). Labor Theory of Value explained, but he does not discuss Piero Sraffa's contributions directly here. 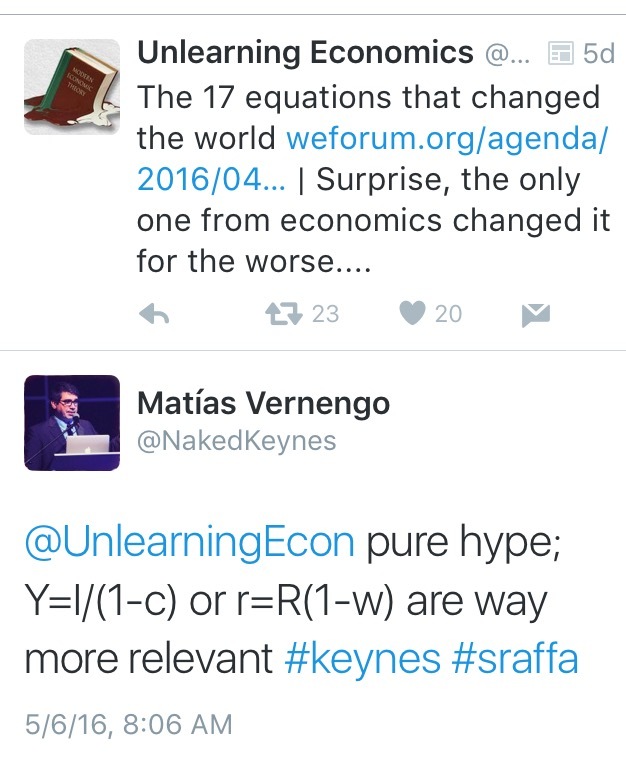 There is no way to understand Marx without Sraffa. As he said in a paper in Social Research (subscription required) Sraffa "rescued [Smith, Ricardo, and Marx] from the trash heap of antique, outmoded ideas... [and provided] a serious alternative to marginalist theories." There we have it again. Another one of those clashes between Greece’s creditors and the Greek government. For the millionth time, the Troika, I’m sorry I mean the institutions, are demanding that Greece comes up with policy suggestions that could bring in 3.6 billion approximately in fiscal savings. This time, though, is different because these are going to be a “just in case” package, a buffer in case the government misses its fiscal targets. The government wants to finish the negotiations as soon as possible in order to remove the uncertainty that has grinded the Greek economy to a halt but it does not want to pass any preliminary measures. The negotiation on other issues is coming closely to an end, or so it is being reported, but this issue persists and the final decision is to come from the urgent Eurogroup meeting on Greece that will take place on the 9th of May. Why all this fuss? Well, Greece urgently needs a disbursement of some of its 80 billion euros bailout money in order to cover its debt payments that are coming up in the summer. In addition, if the measures that are agreed upon during the negotiations are passed, the “forbidden” book of debt relief might be opened. The IMF insists that Greece’s public debt is unsustainable and some sort of debt forgiveness is necessary or else it won’t be able to take part in the bailout. And it might just be the case that the IMF is capable of doing anything in order to impose its ideology (Hint: The recent leaked discussion). How is it that more austerity will make the public debt more sustainable, though? A form of debt relief was granted to Greece in 2012 with the so-called PSI. Interest rates on its official loans are at rock bottom; not having to pay 5 % or 10 % interest payments could be seen as a form of debt relief. How come that is not enough? This back and forth between the Greek governments that have passed by the last 6-7 years and the official creditors has always ended up with more austerity, more deregulation and well, more of the same; more of the same failed policies that are not even addressing the root of the problem; the depressed Greek economy. If the Greek economy were growing, nobody would be worrying about Greece’s debt. Public debt should never be a problem and it doesn’t have to be. The real issue that both the creditors and the Greek government are not paying attention to is how to get the economy back on its feet and put an end to the humanitarian crisis that is plaguing the nation. There is only one way to put an end to this. Grexit; yes Grexit. It’s going to be difficult in the beginning but it might be the only sustainable long-term solution. The Bank of Greece would have to secure enough reserves, through some sort of external loans, to support the exchange rate and to pay for imports. Printing new bills would take some time so the euro and the drachma would probably have to coexist for some months. The banks would have to be nationalized since a bank run is very probable and no external funding would be available for them. 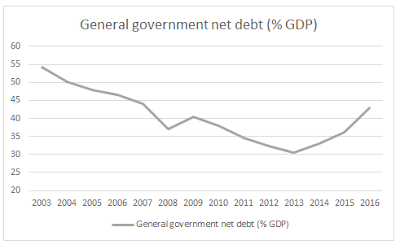 But the point here is that Greece’s economy did not tank because public debt is high nor did it tank because it has severe structural issues, which it partly has. The Depression was a result of a severe fall in aggregate demand. The financial crisis took a toll on Greece’s banks, which then had to be nationalized. Lending contracted along with consumer and business spending. That’s where the government has to step in with aggressive fiscal expansion that will invigorate “animal spirits”. 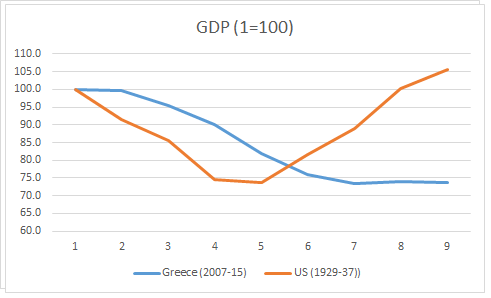 The structural reforms, that the creditors want Greece to pass, are not going to do anything to support demand, and austerity has depressed aggregate demand even more. That is the main culprit of this disaster. Government spending does not have to be constrained by borrowing. If Greece had its own currency, it could fund income support and employment programs with central bank credit; yes, by printing money. Mainstream economists will scream “hyperinflation” if anybody proposes such kind of policy. With the economy operating well below capacity, inflation is not going to be a problem and it’s actually needed. The economy is experiencing debt deflation right now. Unserviceable debts need to be dealt with immediately if consumer spending is to pick up for good and the only way to do it is if the government provides assistance to troubled borrowers. That should have been the official “Plan B” of the Greek government; Grexit. The debt cannot be serviced and it needs to written off. The Greek economy and the Greek people have been sacrificed on the altar of debt servicing and it has to stop. There is a way to recovery that does not involve any more of the so-called “internal devaluation”, which is obviously not working. Wages have collapsed by almost 20 % and unemployment is still stuck at 25 %. Greece can rebuild its economy but only outside the Euro. A well-designed industrial policy could bring manufacturing back to life, employment and training programs can bring down the prohibitively high unemployment and the reversal of social spending cuts can help alleviate poverty. Comprehensive regulation of the financial system could prevent a repeat of a financial crisis and direct lending to the real economy. Finally, the labor laws that were repealed need to be brought back and labor unions need to be strengthened if wages are to go up. Labor unions and collective bargaining were one of the reasons for the thriving middle class all over the world until the era of neoliberalism in the 1980s. Unless a government that is bold enough to stand up to the neoliberals of the EU and the IMF takes power, the theatrical negotiations will keep going, the government will keep caving in and more of the same failed policies will be implemented. 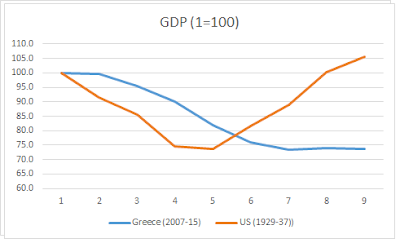 Real GDP starting in 1929 for the US and 2007 for Greece. Back then, with the New Deal, the US economy had essentially recovered after less than a decade. But there is no solution in sight for Greece now. This summer with more payments due, and the Brexit discussion on top, should bring new developments. The private sector added 156,000 jobs in April, according to the Automatic Data Processing (ADP) report, ahead of the Bureau of Labor Statistics (BLS) more comprehensive release this Friday. As the graph shows there is a slowdown form last month. This adds to weak manufacturing growth,and a smaller trade deficit, resulting from lower imports, that is, a slower economy. I still think a recession might not be in the immediate horizon. However, the data seem to indicate, as I said before, that there are good domestic reasons for Yellen not to hike the rate of interest. By the way, not surprisingly labor productivity has been weak, and according to the BLS it "decreased at a 1.0 percent annual rate during the first quarter of 2016... From the first quarter of 2015 to the first quarter of 2016, productivity increased 0.6 percent." This is sometimes reported still by suggesting that "low productivity [is] a puzzle to economists." It shouldn't be a puzzle, of course. Low productivity is the result of low growth. And that is the result of a contractionary fiscal stance, in an economy with too much inequality, and slow growing wages. "Sclerotic growth is America’s overriding economic problem. From 1950 to 2000, the U.S. economy grew at an average rate of 3.5% annually. Since 2000, it has grown at half that rate—1.76%. Even in the years since the bottom of the great recession in 2009, which should have been a time of fast catch-up growth, the economy has only grown at 2%. Last week’s 0.5% GDP report is merely the latest Groundhog Day repetition of dashed hopes." That is all true, and I myself complained about slow growth last week. However, this gives a false impression that the slowdown is a very recent thing, of the 2000s. In all fairness there has been a slowdown in growth going back to the 1970s or at least the 1980s. Growth since 1973 has been around 2.8%, and 2.6% since 1980, the years of the first oil shock and the productivity slowdown, and the beginning of the Reagan revolution respectively. 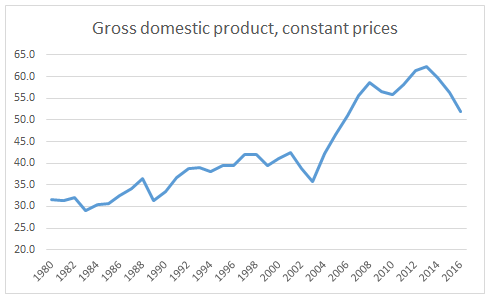 Yes, it is true that growth has further slowed down since the last recession (1.8% since 2000, and 1.2% since 2008), but growth has not only been slower over the last three decades (which, by the way go hand in hand with worsening income distribution), but also it has been more dependent on financial bubbles. And the last three recessions have been associated to the burst of a bubble. And given the structural conditions of the US economy, it seems that only with a bubble we will have healthier growth again. The point is that an economy that depends on excessive accumulation of private debt, and debt-driven consumption bubbles is more volatile and prone to crisis. And that is associated both to financial deregulation and worsening income distribution. Certainly not to what Cochrane sees as the main American problem: "that the U.S. economy is simply overrun by an out-of-control and increasingly politicized regulatory state. If it takes years to get the permits to start projects and mountains of paper to hire people, if every step risks a new criminal investigation, people don’t invest, hire or innovate." The notion that further deregulation would lead to a spurt of growth is preposterous. Yeah, because deregulating the financial sector has worked so well. By the way, investment is a result of growth (accelerator) as well as innovation (Kaldor-Verdoorn). The problem is not enough spending on a sustainable basis, because party politics impedes public investment, and income inequality makes private spending more unstable. Austerity and inequality, not excessive regulation are behind low growth. But at least he is right that growth did not slowdown because of lack of innovativeness or a savings glut. The US example shows all too clearly that the longer such unconventional policy remains in place, the harder it is to exit. Most likely, ultra-low rates will remain a fact of life for the foreseeable future, with no return to a scenario in which asset prices mostly reflect their intrinsic worth... Negative interest rates are a dangerous comfort blanket. They show that the proverbial punch bowl will continue to be replenished while the party is on. Investing is now mostly about second guessing the central banks’ next move, which even central banks themselves are not sure about. I have a more benign view of unconventional monetary policy. It is there to support expansionary fiscal policy. But that has been like waiting for Godot. 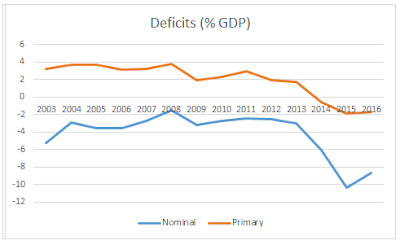 What the US example really shows is that, in the absence of significant fiscal expansion, monetary policy is not sufficient to get the economy out of the hole. You need to use the low rates, which allow government to borrow on the cheap, and boost public investment. Infrastructure spending used to be a no brainer. So the problem is not the central bank as a sugar daddy, but the stagnation policy which results from a consensus that budgets have to be balanced, and spending reduced. The legacy of almost four decades of conservative economics, which, by the way, has been accepted by too many left of center parties.